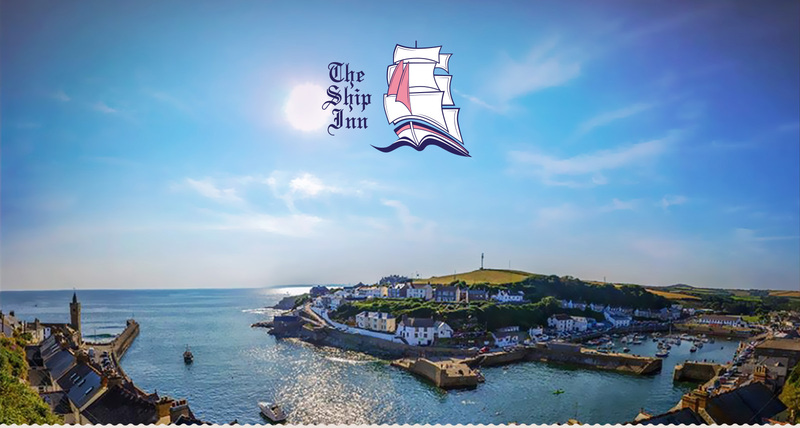 The Ship Inn Porthleven – Set on the Harbourside in picturesque Porthleven, Cornwall. The Ship Inn in the perfect Cornish Pub. All the crew welcome you to The Ship Inn Porthleven. Opening hours are: 11:00 till midnight everyday. Food served: 12:00 till 14:30 and 18:00 till 21:00. Please note that food is not served on Sunday evenings during winter months. Please note: We do not take bookings as we are a small pub and we operate on a first come, first served basis. All our food is cooked freshly on the premises in our small kitchen; please note that because of this, during busy periods there may be a small wait on food. We thank you for your patience and understanding. Here is a sample of our menu. We also serve daily specials. If you need to know the ingredients in any of our dishes please ask a member of staff. Lunch is served from 12:00 to 14:30 and Dinner from 18:00 to 21:00. All burgers are served with baby gem lettuce, cucumber and tomato in a Baker Tom brioche bun with fries and coleslaw. Sandwiches are served on granary bread and come with a pot of fries. We regularly keep 5 ales at The Ship and pride ourselves in sourcing only the best local beer. We also stock a wide range of wines, lagers, ciders and spirits to suit most tastes. A selection of a few of the usual suspects are below. Taste note: Straw-coloured and zesty, with strong citrus aromas, starting with a zip of lemon and lime in the mouth, and ending with a flash of passion fruit. Brings out the best in spicy food, smoked meats and kebabs. Taste Note: The fresh aroma of hops blends seamlessly with light fruity-sweet notes. In the mouth the beer feels succulent and despite its lower gravity delivers a good measure of hoppy bitterness. This is complemented by a light, almost honeyed malty sweetness. Taste note: A proper IPA with grapefruit citrus notes provided by Citra hops. Based on Maris otter malt, this is a really nice session beer perfect for getting shipwrecked on a sunny afternoon! A dark amber hue and an initial malty flavour with a citrus after taste. The 4.8% ABV Special brew has proved very popular and is now a regular feature of Tintagel Brewery’s suite of real ales. Welcome to the home of The Porthleven Drinking Club. News and meeting details coming soon along with an exclusive Drinking Club Tee Offer.